Do you live in Gunthorpe? Does your Child or a Family Member attend NORWOOD PRIMARY SCHOOL,GUNTHORPE PRIMARY SCHOOL or WELBOURNE PRIMARY SCHOOL? You may have seen my previous facebook posts regarding the work I have been doing with the LOCAL Primary Schools. If you haven’t DON’T PANIC! You can update yourself by clicking the link above…or reading my previous blog posts. Since my last post there has been many updates in regards to all THREE of the Schools. 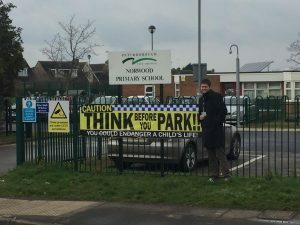 Norwood is the last of the three schools to be provided with the safer parking banner after my request. The reason for this is up until the last Full Council Meeting there were only 2 Banners to rotate between all of the Schools in Peterborough…yes that’s 2 to share with over 60 schools. However it is now Norwood’s turn to have the Banners…and I’m pleased to see they are up and looking Fantastic! I sincerely hope they help to work towards tackling the parking issues. I have accompanied the Safety Officers as promised to visits to Gunthorpe Primary School. This is just a gentle reminder that although the officers are there to promote safe parking; they are very busy people and my role is purely to ask and request for them to be in attendance; where they choose to place themselves on their visits in down to their own discretion. The Safety Officers role is also not to ‘Catch’ people out it is to help prevent the dangerous parking. You may think “The people who park illegally day in and day out do not get ‘caught’…If the officers weren’t so visible and wearing such clear outfits the people who park illegally would not notice them and get caught”…The fact these people are thinking and not parking where they usually illegally park;is fantastic…this means the officers being there is preventing the illegal and dangerous parking. Another reminder is; The Officers are unable to move on people in the school ground i.e. 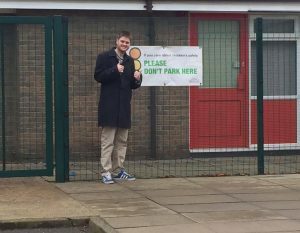 the car parks…this is the school itselfs property and is completely down to the school’s discretion to implement rules and to make sure they are carried out. You can speak to the Caretaker or Headteacher if this is an issue. Visits will continue to be made by myself and officers, banners will continue to be implemented if they deem to be working! But please get in touch if you feel there is anything more or less…that I can do to help this situation. 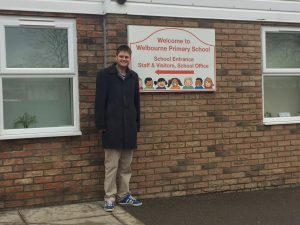 Welbourne Primary School has been having repeated visits from the safety officers and I am pleased to say that NEXT WEEK Welbourne will be visited by myself…Jenny Wright and the Parking Prevention and Enforcement Officers. I will be attending Welbourne School on 16th and 17th February in relation to the parking issues. Ms Wright will be handing out seatbelt information and explaining to the parents the problems if they are parked illegally or dangerously. In conjunction to this Welbourne have asked some of their KS2 pupils to accompany us to highlight the dangers to the parents. The officers will be ticketing illegally parked vehicles! 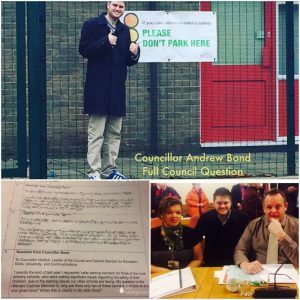 I will continue to keep you updated and I hope you feel that what I have already done is helping contribute towards a safer Gunthorpe at School Times. This entry was posted in Arts & Culture, Business, Cambridgeshire, Campaigns, Cartoons, Community, Council, Environment, Features, Gossip, News, Parliament, Transport and tagged Banners, City Council, Cllr Andrew Bond, Cllr Bond, Councillor Andrew Bond, Councillor Bond, councillors, FEATURED, Gunthorpe, Norwood, peterborough, peterborough city council, Peterborough Liberal Democrats, Primary Schools, Safer Parking, schools, Welbourne Primary School. Bookmark the permalink.